The energy provider said Friday's lack of coal usage was a "watershed" moment. Britain's previous longest continuous energy period without coal until now was 19 hours - first achieved last May, and again on Thursday. Cordi O'Hara, of the National Grid, described Friday as "a watershed moment in how our energy system is changing". She added: "The UK benefits from highly diverse and flexible sources of electricity. Our energy mix continues to change and National Grid adapts system operation to embrace these changes." But Ms O'Hara says that while the country makes the transition to a low carbon system, coal remains an important source of energy. According to Gridwatch.co.uk, around half of British energy on Friday came from natural gas, with about a quarter coming from nuclear plants. Wind, biomass, and imported energy were also used. Coal has powered Britain for more than a century. 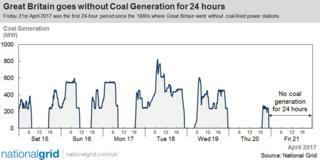 But Friday's landmark moment - the first 24-hour period without any coal-powered generation - is a sign of how the once mighty fuel is being consigned to history. Part of the reason is that solar panels and wind turbines now provide much more electricity to factories and homes. Lower power demand is a factor too - that's normal on a Friday. And as older, uneconomic coal fired plants have closed in recent years, the fossil fuel has been playing a much smaller role in our energy system. The last deep coal mine in the UK, Kellingley Colliery in North Yorkshire, closed in December 2015, bringing to an end centuries of deep coal mining in Britain. Hannah Martin, from Greenpeace UK, said: "A decade ago, a day without coal would have been unimaginable, and in 10 years' time our energy system will have radically transformed again." Coal remained a dominant part of the energy supply until the 1990s, but its use has fallen in recent years, as plants closed or switched to burning biomass such as wood pellets. It accounted for just 9% of electricity generation in 2016 - down from 23% the year before. However, there have been claims that using wood pellets to generate electricity is actually speeding up, not slowing down, climate warming. A study published by Chatham House in February said wood is not carbon neutral and emissions from pellets are higher than coal, making pellet use a flawed policy. The energy industry rejected the report, saying that wood energy cuts carbon significantly compared with fossil fuels. 1956 - The Clean Air Act is introduced to reduce air pollution. It includes powers to establish smokeless zones, and provides subsidies to householders to switch to smokeless fuels to heat their homes. Coal-burning power stations are moved out of cities.